Peter Obi, PDP's Vice Presidential Candidate. "Whether or not the economy has the long-term stamina to mathematically shoulder the burden is another conversation. We focus simply on facts"
"This present regime has plunged us into a deeper debt profile to the tune of $80 billion, an indication that the nation is collapsing". That's according to the Vice Presidential Candidate of the Peoples Democratic Party, Peter Obi. He was quoted by Vanguard to have said this on October 24, 2018. 1. 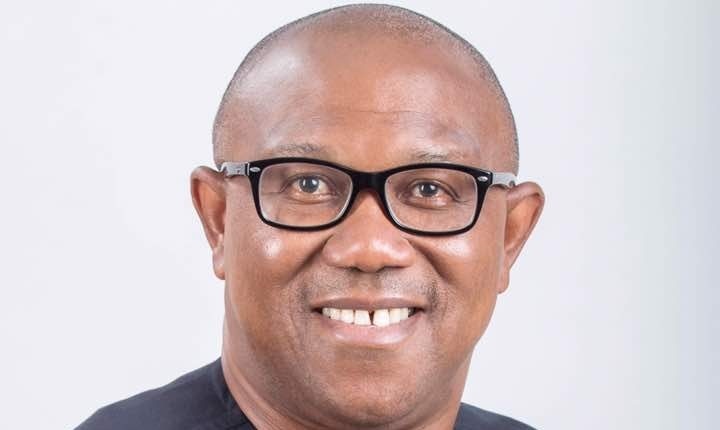 Vice presidential candidate Peter Obi claimed that Nigeria’s current administration has raked up US$80 billion in debt. 2. At the end of June 2018, total debt stood at N22.4 trillion, or $73.2 billion at the official exchange rate. 3. The figure excludes money taken from funds set aside for other purposes. The Debt Management Office coordinates the management of Nigeria’s public debt. This includes domestic, external and subnational debt, as well as bonds, treasury bills and other tools the government can use to raise money. The sub-national debt – owed by lower levels of the government – includes loans taken out by Abuja’s federal capital territory and the country’s 36 states. The debt office reports on Nigeria’s debt every three months. Its website shows that at the end of March 2015 – two months before Buhari took office on 29 May – the country owed a total of N12 trillion. At the end of June 2015, this debt had risen slightly to N12.1 trillion. This was US$63.8 billion at the official exchange rate of the time, N196.95 to the dollar. By the end of June 2018, total public debt had almost doubled to N22.4 trillion. The debt office said the latest increase comprised of a US$2.5 billion Eurobond issued by the government in February 2018. This took Nigeria’s total debt to US$73.2 billion, using the Central Bank of Nigeria’s 2018 exchange rate of N305 to the dollar. What is the government borrowing for? The debt management office justified the borrowings in its 2017 report on Nigeria’s national debt. “While Nigeria’s total public debt stock is relatively low vis-à-vis the country’s GDP, the increased funding requirements needed to sustain the economic recovery, address the huge infrastructural deficit, as well as meet budget financing requirements, would entail enormous funding resources, including borrowing,” it said. Prof Olufemi Saibu of the economics department at the University of Lagos focuses on development macroeconomics and public finance. He told Africa Check the debt might be worrying, but would be justified if it were used for development projects and not just for regular spending on, for example, salaries and overheads. “The debt profile is high but it’s not in the red lines yet,” Saibu said. Does Nigeria’s government owe even more? 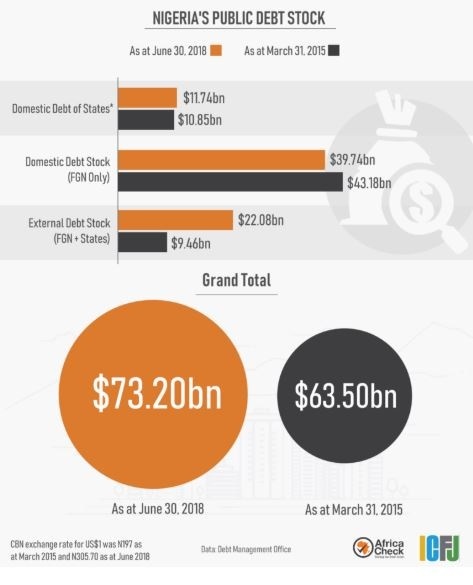 While Obi’s claim is largely true, the real picture of Nigeria’s debt is larger than what’s reported by the debt office, according to Atiku Samuel. He is the head of research at BudgiT, a civil society organisation that works to make public spending transparent and accountable. These would add to the debt “if you look at debt from the globally accepted definition, as these are still obligations to the government”. In campaigning for Nigeria’s 2019 elections, politician Peter Obi said President Muhammadu Buhari’s government had increased the country’s debt to $80 billion. Debt Management Office records show Nigeria owed N12.1 trillion in June 2015, a month after Buhari took office. This was US$63.8 billion at the exchange rate of the time. By June 2018 total public debt had risen to N22.4 trillion, or $73.2 billion. An expert said the debt could be even higher as the government took money from funds set aside for other purposes. We therefore rate the claim as mostly correct.